You are here: Home / Our Animals / Chickens / Do Ducks Molt? Here’s What You Need To Know! Do Ducks Molt? Here’s What You Need To Know! Why do they lose so many feathers? What should you feed during a molt? In short, yes ducks molt. In fact, they molt quite a bit every year – possibly enough to build you a whole new duck. In fact, I’ve gone outside and wondered whether the drakes, hens, and young ones had a pillow fight the night before and didn’t invite me! You might even wonder how such a little bird can have so many feathers hidden – more on that in a minute. Our hen Henrietta, a Khaki Campbell is molting presently – and she looks quite a bit disheveled. Not sleek and bright like the younger ducks in her pen! Like chickens, ducks molt to replace old feathers with new growth, and they do it every summer. So, expect it to be an annual event. 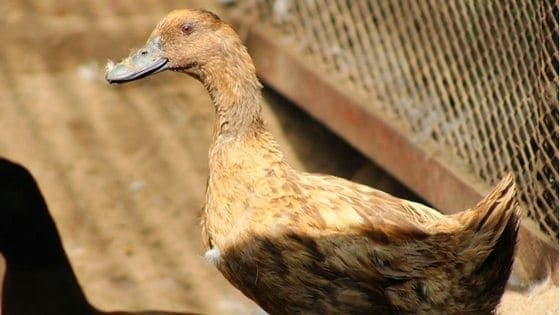 Ducks molt different than chickens, and in the main summer molt, both duck hens and drakes will lose feathers. Chickens molt by losing them on their head, neck, and back, and then regrowing them in the same top-down pattern. Ducks, on the other hand, just lose their feathers all over the place and all at once, including their primary ones. They’ll also scratch and pluck them out with their bills to speed things along or just relieve the itch. Henrietta has been caught with bits of plumage all over her bill – she dunks herself in water to clean it off! You might also notice your ducks aren’t playing or interacting as much – again, this is normal. Henrietta has been staying a bit back from the younger ducks as she loses her feathers. Additionally, drakes (male ducks) will undergo an additional molt after the spring breeding season has ended – they will lose their fancy colored plumage for duller colored feathers – this is an evolutionary adaptation that protects ducks from predators. As you probably know, in addition to their primary plumage, ducks also have a large padding of down feathers (the same down you’ll find in coats and other winter apparel). 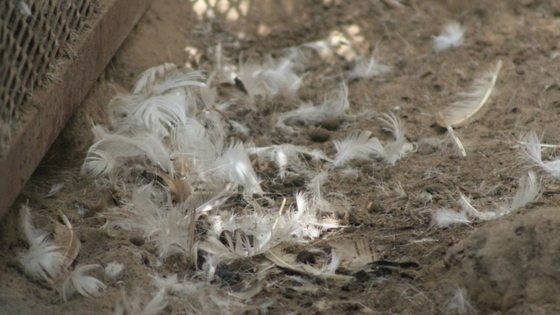 So, ducks will also lose their down during a molt, which is why it can look like a crime scene in their pen – and you might take a headcount, wondering how a predator got into the duck house. Rest assured, it’s just natural feather loss. 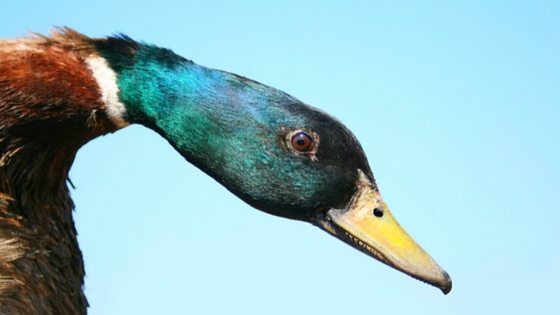 In fact, ducks lose their primary feathers (such as flight) all at once. In the wild, they will be flightless for about a month – no big deal since ducks are usually close to water, keeping them safe from predators. This is less of an issue for domestic ducks, although the sight of it can be overwhelming. Just grab the broom and sweep them out. As Henrietta has molted, she’s looks very disheveled, and her color appears mottled – this is a result of losing feathers as well as loose ones that haven’t yet been shed. Eventually, glossy new plumage will appear, and the ragged hen will look sleek and beautiful again. Just remember, that the length of time it takes to complete a molt will vary from duck to duck. While your ducks molt, you might notice the hens’ egg production goes down – this is normal. Like chickens, growing new feathers requires a lot of protein for ducks. We’ve noticed that Henrietta is laying less, and when she does lay an egg, they’re smaller. Again, this is totally normal, and once she’s done molting, production picks back up. If your ducks stop laying completely, don’t worry – it’s normal, and they’ll start again eventually. When your ducks molt, it’s a good idea to give them extra protein. You can give them more feed, or offer treats of dried mealworms floating on water (it also provides extra entertainment). Giving them high-nutrient treats such as kale or parsley will help as well. You can also switch to a higher protein feed. Hi Herdy, the Young Living Premium Essentials kit is what I usually recommend to get started – it has everything including oils for cleaning, peppermint for coop cleaning, etc. You can find it at https://thefrugalchicken.com/essemtial-oils. You can buy all the components separately, but you’ll end up paying more. I got my kit free, if you’re interested in learning how I did that, you can email me at editor@thefrugalchicken.com and I can give you the details. I hope this helps – essential oils make healthy living really easy and convenient.